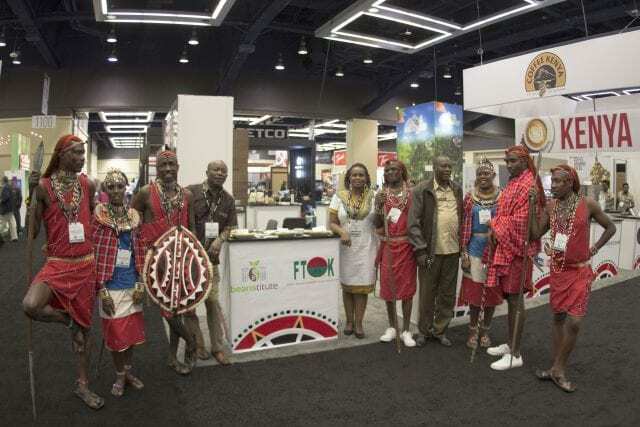 All eyes turned to Kenya at SCA Global Coffee Expo, as the country was named the 2017 Portrait Country. And there’s no doubt that this country is one of the specialty coffee industry’s favourite regions. But what sets Kenyan coffee apart? How do its processing methods and unique varietals affect the flavor profile? And why is it becoming easier for buyers to engage in direct trade with producers? 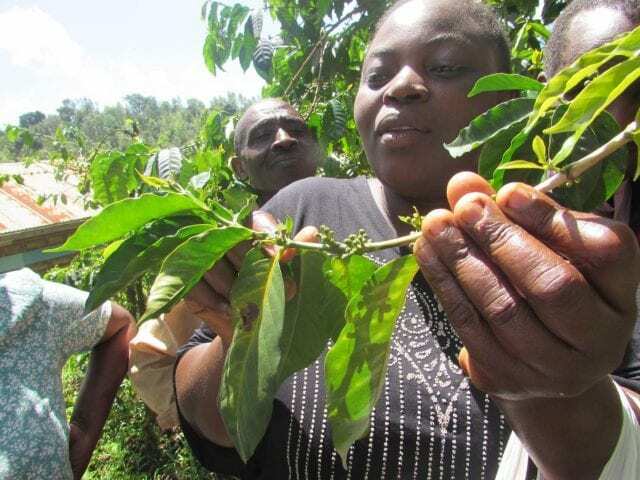 I spoke to Sophie Mukua, Francis Kioko, and Benjamin Kiarii of the Fairtrade Organization of Kenya (FTOK) to find out the answers to these questions – and more. A complex and fruity cup. Bright acidity, a full body, and a distinctive aroma. Kenya’s typical cup profile makes it a favorite coffee region of many people – myself included. Of course, like any coffee region, there are variations within it. Kenya, generally speaking, has lots of altitude, regular rainfall, and good soil. But it also has six distinct producing regions: Central (Mt. Kenya and the Aberdare mountain range), Western (Kisii, Nyanza, and Bungoma), Great Rift Valley (Nakuru and Kericho), Eastern (Machakos, Embu, and Meru), and Coastal (the Taita hills). Each of these has its own particular climate and growing conditions, along with micro-regions within it – all of which lends nuances to the final cup profile. What’s more, Kenya has a wide variety of varietals. SL-28 and SL-34 are unique varietals, and rarely found outside of the country. These grow in high-altitude regions and are known for their complexity. On the other hand, you also have varietals like K7, which grows at a lower altitude and is drought-tolerant thanks to its long routes. Then there’s Batian and R11, both created in laboratories and both resistant to disease. In addition to specific regions and varietals, you’ll also find Kenyan coffee varieties labeled by bean size, shape, and quality: AA, AB, PB, C, E, TT… The list is exhaustive. AA, AB, and C refer to different bean sizes. PB means it’s a peaberry (the coffee cherry had one round seed, not two) and E stands for Elephant. TT are low-density beans. Classifying beans in this way helps to ensure consistency, so that the entire bag of coffee will produce the same particular flavor profile. Benjamin tells me that there are around 700,000 producers across Kenya, and they tend to work completely by hand, from picking to drying and processing to sorting. Most farms have approximately 1,320 trees per hectare. The coffee is harvested twice a year: once from April-June, sometimes July, and again from October-December or even January. The exact start and end times of the harvest is affected by the region, the weather that year, and the farm’s altitude. The biannual harvests keeps coffee producers busy the entire year. Francis adds that most of the coffee professionals in Kenya come from producing families. You’ll often hear them describe themselves as “children of coffee” – and if coffee is the parent, other producers are their siblings. Most Kenyan farmers work in cooperatives, something that he says increases the uniformity of the coffee. 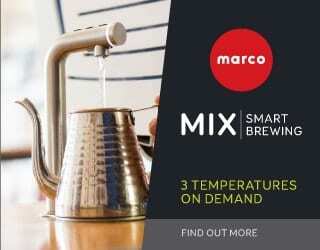 Carefully controlled processing can further support the quality and consistency of the coffee. Benjamin tells me that the 12 cooperatives FTOK works with (all in the Central and Eastern regions) have a well-established production system. Every Tuesday, farmers bring their cherries to the cooperatives, where the coffee is pulped. 72 hours after that, the fermentation begins, and 72 hours after that, they start to dry the beans. The result is a greater level of consistency in the final cup profile. Washed processing is most common in Kenya, but you will also find natural processed coffees in certain regions. Generally, this method is used for MH and ML beans, which tend to be low-quality and/or unripe. Sophie tells me that, in a pilot program, naturals turned out to be more expensive to process than washed coffees. It’s been well-documented that natural processing poses a risk for producers, and often requires a huge investment of time and labor to offset that. Unlike many producing countries in the Americas or Asia, in Kenya the government exercises a certain amount of control over the coffee trade. 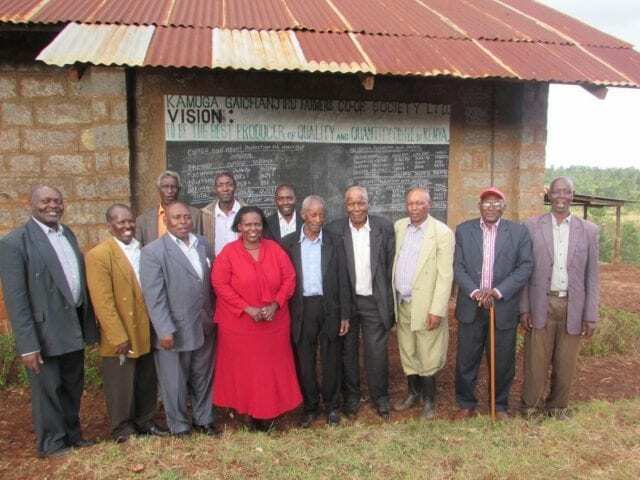 Most beans are bought and sold in a central auction, overseen by the government-run Kenya Coffee Board. Benjamin tells me that these are generally “farmer-friendly laws,” but that if farmers want to sell coffee independently it’s a challenge. Farmers can, to quote him, be “excluded” from the process, while the transportation, communication, and sale of the coffee is done by marketers. 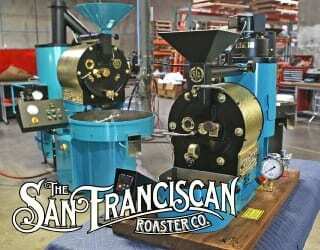 Some producers feel that they do not receive a good price for their coffee in this system. 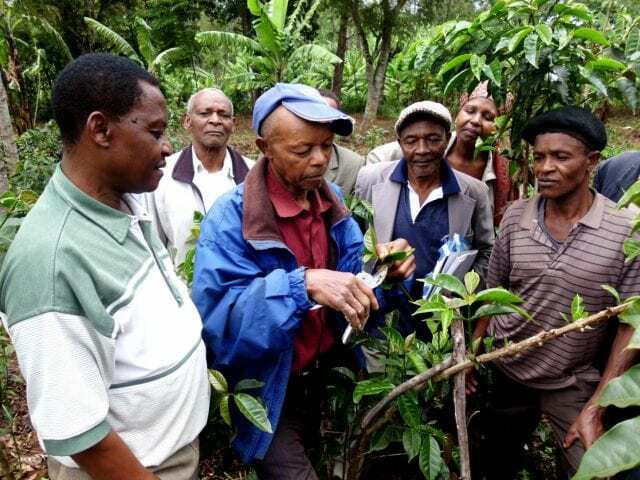 For them, there are simply too many hands between buyer and farmer – and they do not trust the marketer to promote the coffee to the best of their ability, or even tell the truth about the price they received. 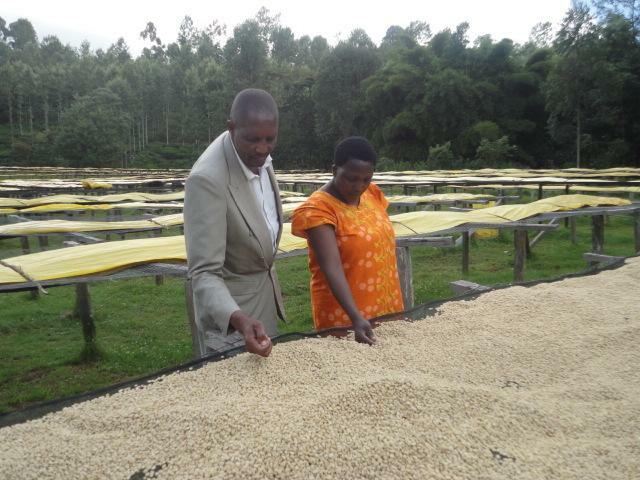 Kenyan producers are passionate about coffee – they are, after all, “children of coffee”. But low pay and a lack of agency can turn passion into disappointment. Recently, in response to negative perceptions of the central auction, the government loosened some of the restrictions on direct trade. 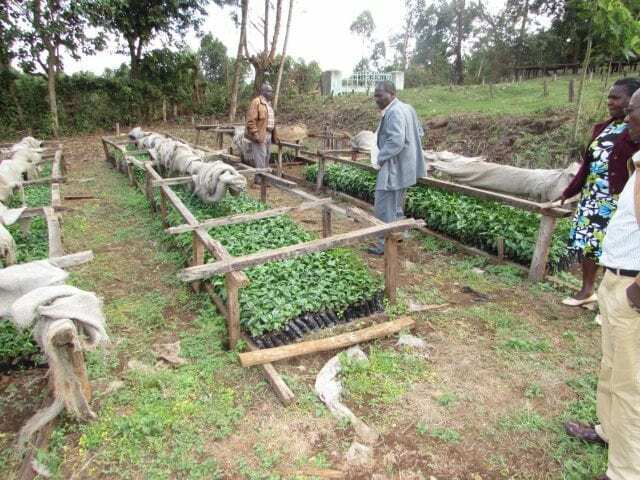 This will make it easier for farmers to sell and export their coffee. And the next challenge is to help those producers get a fair price for their beans, and increase transparency along the supply chain. The team tell me that they’re currently launching BEANSTITUTE, an organisation funded mostly by donations and staffed by volunteers. Once it is fully funded – hopefully before August – they will be responding to these new developments in the Kenyan coffee trade. Their aim is to facilitate the increased transparency that is finally within reach. And they want this transparency to exist not just for the consumer, but also for the farmer. Currently, with the central auction, the team tell me that farmers sometimes have no idea of what happens to their coffee after it’s been processed. They would like producers to know what cupping score their coffee received and who buys it. Francis explains that just minutes before our conversation, they heard from a buyer that a particular coffee scored 93 points – but the producer had no idea of this fact. Situations like this are very common, he says. They couldn’t wait to return to Kenya and let the producer know the good news. Producers deserve knowledge like this. It helps them understand how valuable their coffee is and the impact of their hard work. In addition, BEANSTITUTE will teach farmers about agronomy, coffee roasting and cupping, and how to analyse their own beans. This will allow even those farmers who continue to operate through a marketer to advocate for their coffee’s worth. It may help them to receive a fairer price. 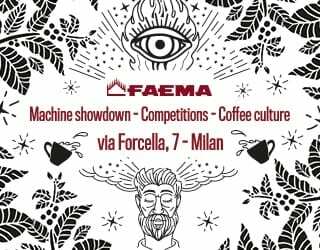 What’s more, the new initiative will provide training for younger coffee professionals, whether as baristas, Q graders, roasters, or producers. BEANSTITUTE want this generation to see the full coffee supply chain, and understand that they have a future in it – something that this increased transparency will enable. Every producing region is unique. Different soils, climates, varietals, and production/processing practices create distinct coffees which, in Kenya’s case, are known for their complexity. Every country also has its own challenges, whether it’s infrastructure, government regulations, or pests and diseases. It’s exciting to see how the issue of transparency is being tackled in Kenya. Knowing more about these high-quality coffees will enable buyers to truly appreciate them. And we mustn’t forget about transparency from a producer’s perspective, either. With Kenya being named the SCA Portrait Country of 2017, there is no better time for us to learn more about this iconic origin. 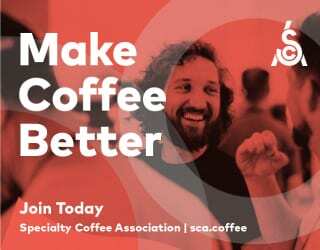 Are you a certified barista, roaster, or trainer interested in traveling to Kenya to support BEANSTITUTE? (Expenses can be arranged.) Or are you an equipment manufacturer who could provide equipment? Get in touch with Sophie Mukua. Please note: Fair Trade Organization of Kenya is a sponsor of Perfect Daily Grind. Like with all our interviews, the interviewees have received a courtesy copy of the article prior to publication. However, Fair Trade Organization of Kenya has had no control over the article copy.